Jiading organized a special auction of handicrafts created by local disabled people to mark the International Day of Disabled Persons on December 3. 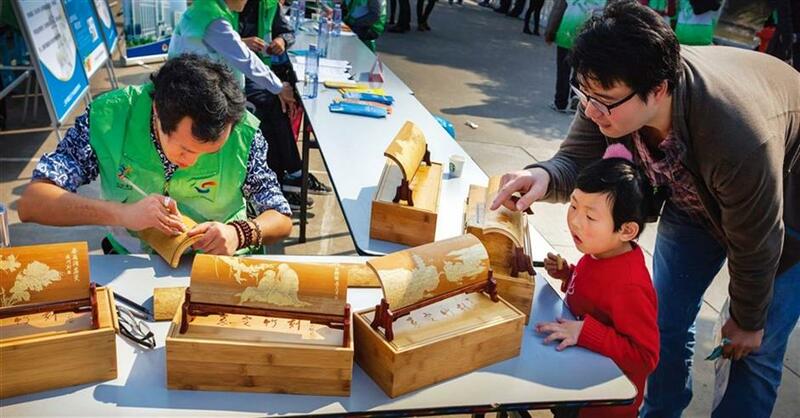 A child and her father observe a volunteer making a bamboo-carving artwork at a community activity aimed at promoting care for the disabled. In addition to the auction, the district has introduced a special bus service, recreational center, care programs, and other welfare projects for the disabled people. When 21-year-old Chen Minghui graduated from the School for the Blind, he was frustrated by the public’s stereotypical view that the blind people could only work in massage parlors. “There is nothing I can do to change that, but I can change myself,” Chen said. Chen joined Cao Jun Technological and Innovation Workshop as a lecturer to promote voice control mobile application among blind persons. Cao, the creator of the workshop, is a blind person himself dedicated to developing voice control applications. With the help of Shanghai Jiading Federation of Handicapped People, Chen found out about Cao’s workshop. Chen said he never had thought that he could work with someone as famous as Cao, who once appeared in a feature program on the China Central Television. 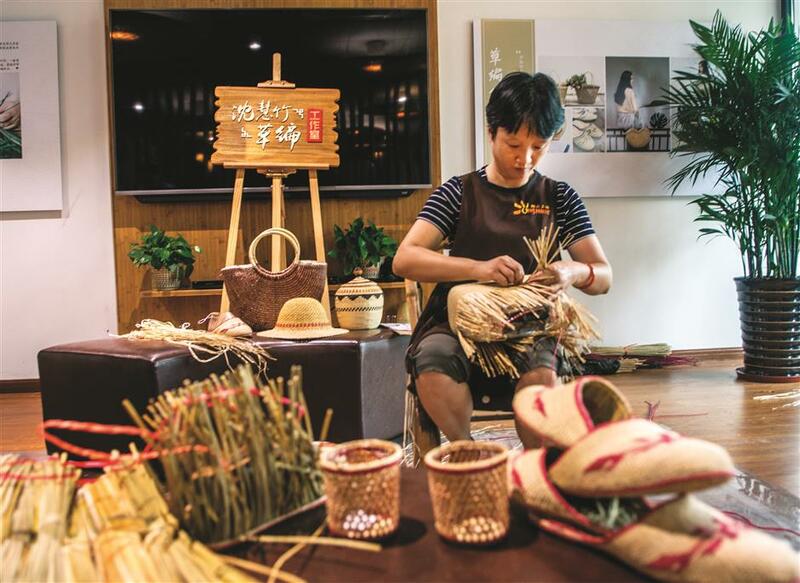 Shen Huizhu, one of the students in the Sunshine Workshop, is making a straw plaiting product. She started learning this Chinese traditional skill from 2011. Cao’s workshop is located in Yangguang Tiandi, an 8,000-square-meter comprehensive recreational center for disabled persons in Jiading with an investment of 100 million yuan (US$15.12 million). The center is the biggest of its kind for disabled persons in the district, and because of its business operation model, it has attracted other seven professional agencies specialized in helping the disabled. On the ground floor of the center, there is a call center for disabled people. Zhou Jiading, operator of the call center, gets a dozen of phone calls from disabled people every day. She helps them to get familiarized with policies regarding the disabled, to get housekeeping service, home appliance maintenance service, food delivery, and door-to-door hairdressing service. Through the center’s hotline 5910-7070, a mother whose son suffers from spinal cord injury was thrilled to learn about the service of Sunshine Bus, that they can get free ride to hospitals. Since the hotline was operational on January 23, they have helped about 2,000 people. Another thing that troubles disabled persons most is wheelchair maintenance. Now, there’s a maintenance company in the center, which has helped many disabled persons to fix their wheelchairs. Jin Zhen, an official with Yangguang Tiandi, said many parts on wheelchairs are easily consumed products, such as wheels, pedals and brakes, which all need to be repaired regularly. Many disabled people would have trouble finding a place to replace or repair them, so they have to make do with their problematic ones. “We not only provide them with the needed parts, but also send repairmen to help fix their wheelchairs,” Jin said. A resident experiences the Sunshine Bus service launched for the physically disabled since June. Although Yangguang Tiandi was invested by the government, it’s actually run by Honghai Industrial Co Ltd, which won the bidding for the center’s management in July. According to the contract, Honghai also should organize a monthly activity for the disabled. In cooperation with the government, Honghai has also opened a 24-hour library, Home Study. Xu Jinjun, chairman of Honghai, said that his company relies on flexible policies, fine management, and social recourses to run the project and to provide more personal services for the disabled. Other projects the center has introduced include social activities such as match-making for the disabled, training courses such as image management and social etiquette cultivation, social awareness for the Amyotrophic Lateral Sclerosis community in Jiading, radio programs describing well-known disabled people’s life stories and also psychological support. In the past five years, Jiading has introduced 30 disabled people aid projects with a total investment of 70 million yuan. 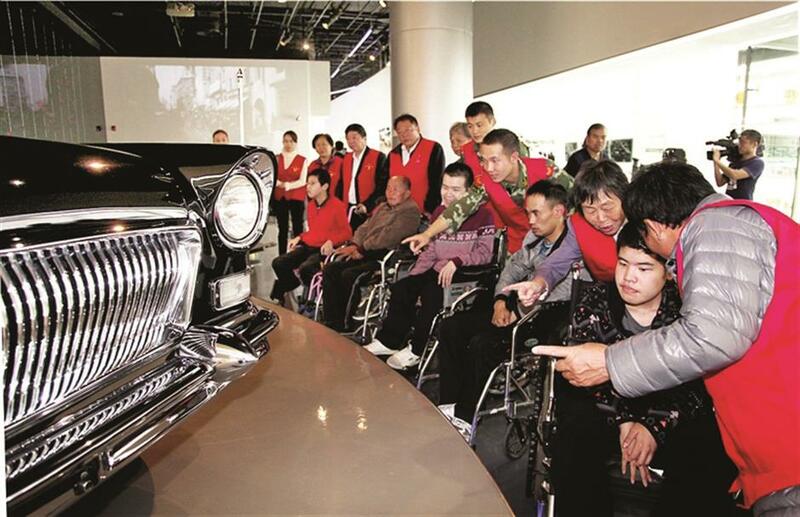 Residents battling ALS visit the Auto Musuem in Jiading with volunteers.